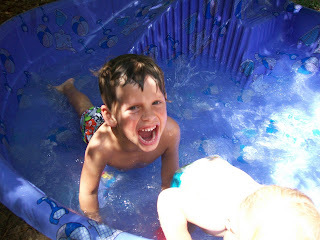 Smiling as he goes down the slide head first. 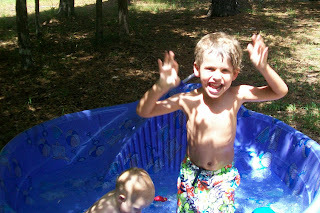 Brady smiling as he holds onto the side of the pool and bounces up and down. 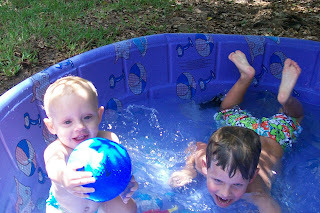 Brady playing with a ball while Dawson swims around. Does Brady slip and fall over and over when in the pool? Yes, he does slip a lot but doesn't seem to mind it. 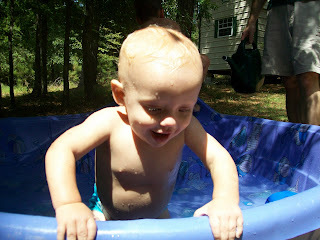 We only put a little water in it so that he doesn't totally submerge when he falls.